« Who is the mysterious filtering software provider? Today, we’re happy to announce that we’ve added some wonderful new features to PlanningAlerts which are the start of something big. Until now, the focus of PlanningAlerts has been squarely and clearly about notifying you of new development applications in your area. That notification happens via email. We’ve added two new big features which allow you to easily explore development applications and comment on them. Finding out about a new development application in your neighbourhood should be the start of something. If it’s something that you agree with or disagree with the standard course of action is that you submit a comment on the development application to your local council. Really, there should be a way for the community at large to discuss these issues without the local council having to act as an intermediary. Of course, this already happens on the Internet in the form of people writing blog posts, talking on Twitter and Facebook and numerous other avenues. Wouldn’t it be great if you could see all those conversations in one place, alongside the development application itself? Then, the application page becomes a jumping off point to read what people think all over the place. We’re hoping this will spark discussion and make PlanningAlerts even more useful by allowing people to provide additional information about the development application. One use of this could be taking a photo with your mobile phone (after find the location using our augmented reality mobile application, of course) and tweeting about it. 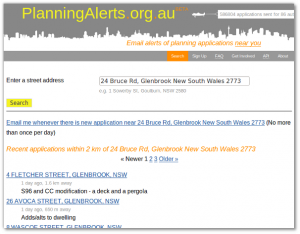 The link will then show up on PlanningAlerts, allowing others to see what the new development looks like. Give it a try and let us know what interesting uses you come up with by posting a comment. We’ve also changed the home page. You can now enter a street address and it will immediately show you recent development applications nearby. No need to wait on receiving your first email alert. We hope you enjoy these new features and don’t forget you can help us improve them by posting a comment below, using the feedback button on PlanningAlerts or, even better, getting involved yourself. 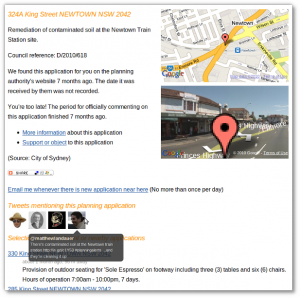 This entry was posted in Announcement, PlanningAlerts.org.au and tagged Blog, comments, facebook, new features, photo, search, twitter. Bookmark the permalink. Post a comment or leave a trackback: Trackback URL.